You don't have to follow an all-or-nothing approach. It's really a matter of common sense. Saturated fats and dietary cholesterol, which are derived primarily from animal products, aren't exactly heart-healthy, but it's all right to eat them in small amounts. McManus says that because eggs are such a good source of nutrients, it's okay to have as many as four yolks a week and whites as often as you like. She also gives a nod to red meat, shrimp, lobster, high-fat cheeses, butter, and organ meats—but only to small portions of each one every couple of weeks or so. Fruits and vegetables have scads of ingredients that lower cholesterol—including fiber, cholesterol-blocking molecules called sterols and stanols, and eye-appealing pigments. The heart-healthy list spans the color spectrum—leafy greens, yellow squashes, carrots, tomatoes, strawberries, plums, blueberries. As a rule, the richer the hue, the better the food is for you. All fats, whether good or bad, have nine calories per gram—about 100 calories a tablespoon. While you switch to a heart-healthy diet you may need to keep tabs on your calorie intake for a while. 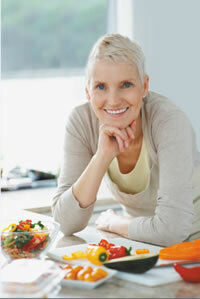 For more information, check out "11 foods that lower cholesterol."